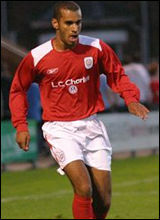 For the second time this week a former loan player has returned to Aggborough and joined the club on a permanent basis. Two days ago it was Andy Ferrell - news item here - and today Paul Bignot made a similar career decision by joining the Harriers on a two year deal. Paul, the brother of former Harriers legend Marcus, first came here at the beginning of October last year and made an immediate impression on everyone at the club. Ironically he made an even bigger impression on another close season target of the Harriers manager, Mark Yates, when he clattered Oxfords Chris Hargreaves and got, somewhat cruelly, sent off for doing something that all footballers have thought about doing at one time or another. He was re-called to Crewe following that incident and then played fifteen times after that. He's turned down an extension on his contract there, and offers from other league clubs, to sign for us.